Two loose pit bulls killed a cat, chased a woman and bit a man the morning of June 23, 2017. According to a news report in The Orange County Register, several eyewitnesses contacted police to report that two dogs had killed a cat in the 3100 block of South Lowell Street. Police said the dogs then went after a woman, but she managed to run away. That’s when they tried to attack a small dog that was being walked by a man near Alton Avenue and Bristol Street. Dawn Fenner, a resident of San Marcos, says she and her pet were injured in a dog attack when they were walking home near Pyramid Lake. 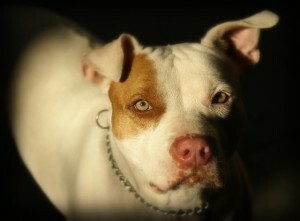 According to a 10News.com report, Fenner says an off-leash pit bull charged at her and her dog. The pit bull tried to get a hold of her dog when she put her hands between her dog’s backside and the pit bull’s mouth, trying to protect her pet. Fenner said she was covered in blood. When Fenner posted her encounter on social media, other neighbors commented saying they had similar encounters with the same dog. One woman wrote she was attacked by the pit bull in late December. She said the dog charged from the yard and attacked her and her dog. Fenner is hoping that her story will help warn her neighbors about the dangerous dog and spark an investigation into the dog’s owner. A 6-year-old boy was hospitalized with injuries after being bitten by a “vicious” dog he tried to pet. According to a news report in The Desert Sun, the dog attack occurred in the 53-500 block of Avenida Rubio in La Quinta the evening of September 23, 2015. Police say they responded to the area where they found that the child had been bitten by the dog. He was transported to an area hospital with wounds to his face and chin. Emilio Rios, 65, was killed and another woman suffered major injuries in a dog attack in North Shore in Riverside County. According to a report in The Desert Sun, the incident occurred early morning on September 8, 2015 in front of a home at 70-670 Sea Gull Drive. Shortly after police found Rios, they heard a cry from a woman who was being attacked by dogs nearby. Officers were able to scare the dogs away, but the woman has been hospitalized with major injuries. An 11-year-old boy has been hospitalized with injuries after a dog attack in Costa Mesa. According to a news report in The Orange County Register, the dog bite incident occurred in the 1000 block of Nancy Lane the evening of August 2, 2015. Police say the boy was walking down the street when he passed by his neighbor’s house whose front door was left open. Officials say a pit bull that was being fostered by the boy’s neighbors came outside.